Yamaha instruments are known for exacting engineering and built with an eye toward making optimizations on competitors' models. The Xeno models are top-end horns designed in close collaboration with professionals in the field. 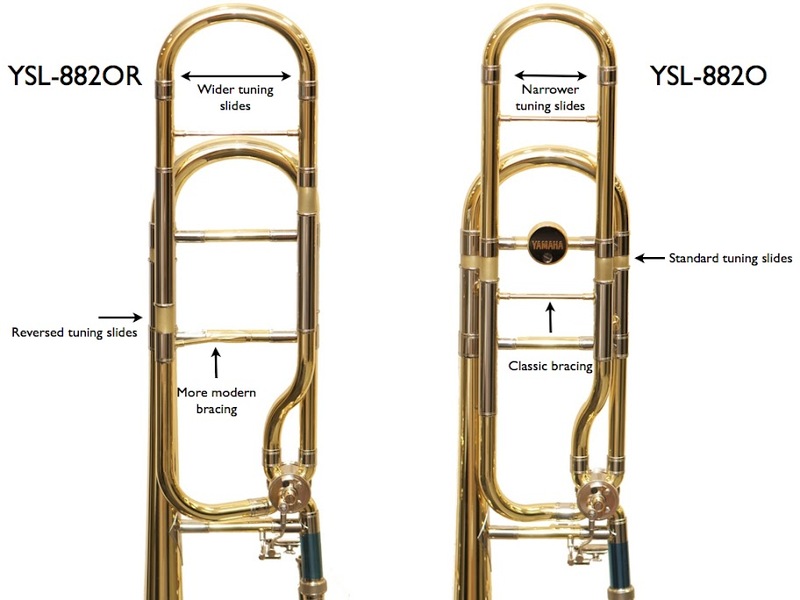 The YHR-882O tenor trombone, designed with Peter Sullivan of the Pittsburgh Symphony, includes a few number of features that differentiate it from competitors like the Conn 88H and Bach 42B. At 8 and 2/3 inches, the 882O bell is slightly larger than the typical 8 1/2 in this competitive set, which adds some openness to the sound. Yamaha's design optimizations have resulted in a very playable horn with notes that slot in nicely. Traditionally, players have complained Yamaha trombones (the 600 series) don't sufficiently distinguish themselves tonally, caught in the center spectrum between the Conn 88H's richness and the Bach 42's clear boldness. But the Xeno 882O, thanks in part to the larger bell, has a traditional bright tone that opens up nicely. To add some more color to the tone, consider the 882GO model that features a gold brass bell vs. the standard yellow brass. Keep in mind that you'll sacrifice some projection with this model compared to the yellow brass. The 8820 features a more traditional narrow slide that adds to the horn's flexibility. While perhaps not as distinctive as some competitors, the 882O is extremely well made and plays reliably -- something that can't be said of some major horn manufacturers today. Yamaha's updated 882OR appears outwardly similar to the 882O, but is designed in collaboration with a different artist, Larry Zalkind, of the Utah Symphony. Typical of Yamaha, the devil is in the details - but these make a big difference to the sound (see a comparison image here). Unlike the 882O, the 8802R features a wider slide --meaning a little less flexibility-- which helps the horn produce a more contemporary, dark sound. Additionally, some adjustments the F and Bb slide positions have been reversed (hence the R in the model number) to allow the bell to vibrate more freely, according to Yamaha. Which horn is right for you? If you like the traditional compact sound of the Conn 88H, you'll likely be happiest with the 882O. While if you prefer a more modern dark sound with a little less flexibility similar to the Bach 42B, the 8820R is the Yamaha model for you. I have the 8820R and it is the best trombone in my band. Very consistent quality of sound and the range great. Would strongly recommend this over the Bach 42B.